The struggling retailer got downgraded to underperform, sending the stock to new lows. What: Shares of retailer The Container Store (NYSE:TCS) plunged on Friday after Bank of America removed its buy recommendation and downgraded the stock to underperform. This move comes about one year after the bank went in the opposite direction, upgrading the stock in Nov. 2014 with a price target that was nearly triple the current stock price. At noon Friday, the stock was down about 14%. 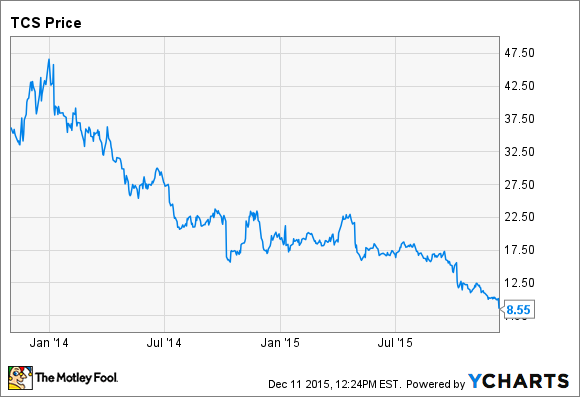 So what: The Container Store stock has been a major disappointment since the company went public in 2013. After peaking around $44 per share at the beginning of 2014, the stock has been tumbling ever since, falling to about $8.70 following Bank of America's downgrade. Year to date, the stock is down nearly 50%. The company's latest quarterly results paint a bleak picture. Comparable-store sales rose by just 0.1% year over year, following a decline during the first quarter, and net income slumped by about 62%. The company expects EPS of $0.38 at most during fiscal 2015, putting the price-to-earnings ratio at nearly 23. Even at the currently depressed stock price, the market is pricing in growth that The Container Store has shown no sign of being able to deliver. Now what: The Container Store is still building new stores, and it expects to increase its total square footage by 12% in fiscal 2015. Right now, almost all of the company's revenue growth is being driven by these new stores. According to the company, 2015 is an investment year, and the employee training, customer service improvements, and additional marketing that are helping to raise costs are expected to begin to bear fruit in 2016 and beyond. Investors don't seem too optimistic.